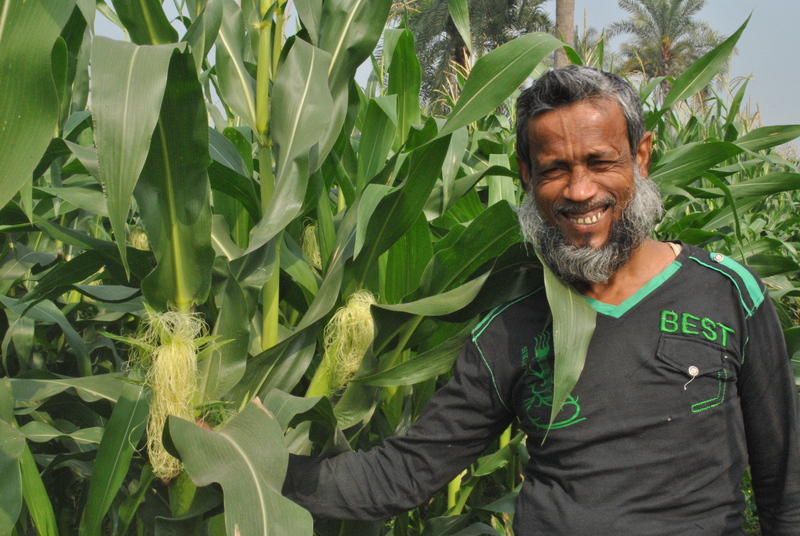 Farmers of Jessore Sadar Upazila in Bangladesh are adopting intercrop cultivation — beneficial for crop yields and helps bring extra money for farmers during the lean period of cultivation. Peas, introduced in this dry season by CSISA-MI, are now cultivated along with maize by many farmers in the Upazila. The price of the produce is good and the farmers are able to cover their cultivation cost with that extra income ahead of harvesting the main crop, maize. By growing two or more crops in proximity, intercropping helps to produce a greater yield on a parcel of land by making good use of resources that would otherwise not be utilized by a single crop. Strategies vary depending on soil, climate, crops and varieties. Peas and maize are a particularly good combination as they don’t compete with each other for sunlight, nutrients or space. Until now, farmers like 55 year-old Abder Ali Biswas of Gobila village cultivated rice only. This dry season, with support from CSISA-MI, he is growing maize intercropped with peas on 0.15 hectares of land. 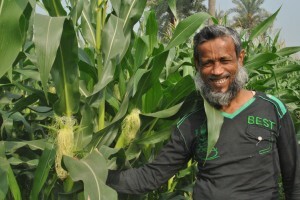 “Next season we’ll have intercrop in 1.34 hectares of land,” said Jasim, son of farmer Biswas. Maize, which is comparatively a new crop in the area, is more profitable than rice and gives more yield per hectare. Intercropping further increases income and decreases the cost of cultivation. Biswas harvested 560 kilograms of peas per hectare this January and sold them at more than 60 percent of his total cultivation cost. As Biswas is making a secure income and his farming has become more cost-effective, his son Jasim is insisting him to use more agricultural technologies advocated by CSISA-MI for better profits.